18 calendars, each featuring a different virtue, plus one blank calendar are included with this product. 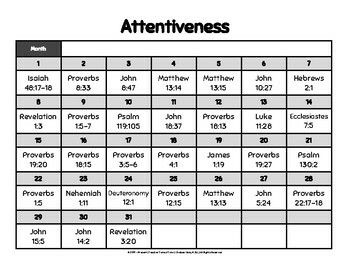 Each calendar features a different virtue with corresponding Bible verses. 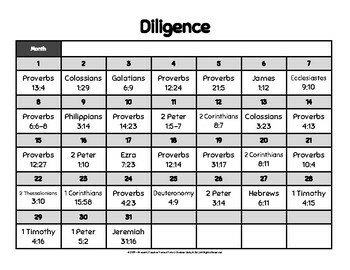 Typically, there are 1-3 verses for each of the 31 days on the calendar for learners to copy. Extend this activity by reading the entire chapter from which the verse originates. Every virtue/month contains 31 days worth of verses for copying so each page can be used for any month of the year. Each calendar page includes a space for writing in the month of use. Choose a virtue, write in the month of use in the space provided, then go to the correlating date to see the chosen verses. 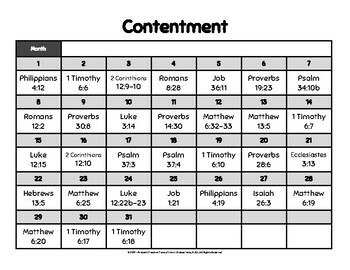 These verses can be read aloud as dictation work or displayed for direct copywork. Students could also be given a copy of an assigned calendar or a calendar of their choosing. They would be responsible for completing the copywork for the month independently. The benefits of copywork are well established. Copywork gives writers a safe place to start. This means students don’t have to create their own ideas to write something meaningful. Students learn the functions and mechanics of writing. Students learn to pay attention to the conventions of writing. Copywork securely introduces students to writing and poetry of deeper meaning. Copywork helps students to memorize significant pieces of writing. Copywork allows students to practice their penmanship. Copywork can be used to teach students how to credit authors. Copywork can be used in all subject areas to introduce, reinforce, or invite learning. You may have a piece of copywork displayed on your classroom’s whiteboard, chalkboard, Elmo, document camera, overhead projector, SmartBoard, or other display/projection system for all students to complete. Or, you may allow students to choose from a selection of copywork materials. Copywork is easy to differentiate because all students can choose to copy (and credit) a different piece of writing. Copywork exposes students to a variety of types of writing, themes, types of literature, and a plethora of authors. Copywork can be especially supportive to new learners of English. Copywork can be used as an intervention strategy for students struggling with writing. 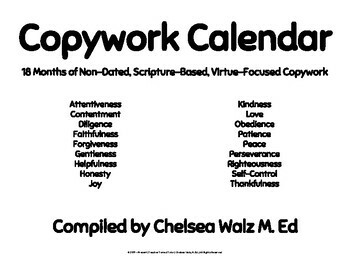 Copywork is a life skill. Throughout life, we are asked to copy information in instances such as note taking, writing a recipe, or writing directions. Copywork activities can be extended by asking questions and creating a discussion. Example questions include: What do you think the author is trying to convey with this text? How can you apply this text to your life? How does this text connect to our current studies?